Oh Vogue. It’s always amazing to see how one event can unite the varied fashion crowd. The night boasted glasses of champagne and mojitos, cotton candy and sushi, and of course fashion. With over a hundred different stores opening their doors to Vogue’s readers, everyone that came left with a smile. So how did Vogue fair with their design and branding? The collector’s edition t-shirt seemed underwhelming this year with a sports-like theme that i assume signifies a camaraderie of the fashion folk into one. Last year, the shirt wasn’t amazing, but more simple; black and white, easily readable and easy to wear. Whats more is that the last year’s shirt fit cohesively with the marketing of Vogue. This year did not. The shirt did not reflect any tone set by the invitation, plus the ad of the model wearing it, looked so early 90’s. Also, where did the navy blue and orange come from? Ya I know the colors are complementary, but still. The font has a collegiate feel around it (cough*Pink by Victoria Secret*cough) and the styling makes me wonder if they really were trying to pass this off as something you could wear to Chanel. Which, for the record, if you ever want to be stared up and down disapprovingly, wear this shirt to one its stores. Banners, like the one above, were hung outside of each store that was participating. They were iconically colored black and white and kind of gave off a neutral feeling of Vogue’s involvement. The banners were easy to spot once you noticed they were there. Vogue did a great job making a map of the streets and stores involved with the event. The map was in the special hand out issue that came with the September Issue and the collector edition t-shirt. As you can see, I marked my map up with my top choices. The same map was available in several different stops on the streets. Those came in handy, especially in the rain when my map got a little too wet to use. They also put a huge billboard of the map on Rue Saint Honore for those unable to read small print after having a few too many champagne cocktails. The map was a nice change of pace compared to the stark and black and white from everything else. It accurately depicts the store locations and streets of Paris. 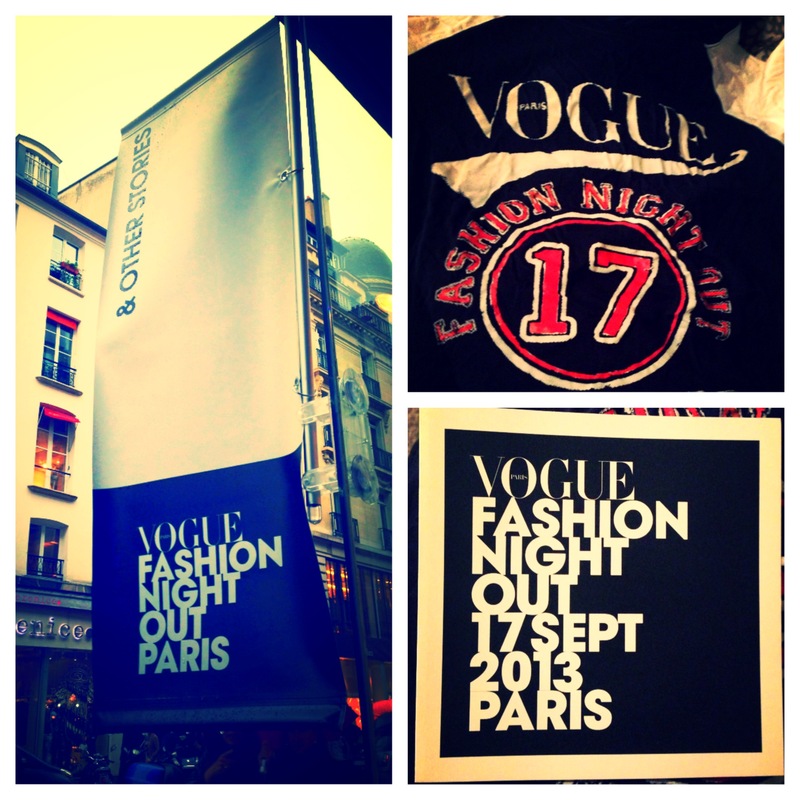 The message is clear, its Vogue, its Fashion Night Out, its Paris. Vogue kept their signature logo apparent throughout. Overall, I approve of Vogue’s design elements this year and look forward to what next year brings! Previous Post Testing 1.. 2.. 3..